So, I decided to update the cover art for The Burning One, because I felt like the first cover didn’t really get across what the book was about. I think this new artwork is a lot more eye-catching. Woot! I feel good about it. It should be live on Amazon by the end of the day. Very exciting. When I decided to write The Burning One as a stand-alone, I didn’t realize how difficult it would be to market it! It’s a rock-star romance (such stories usually involve drug-use, multiple partners, and other wild and crazy scenarios) which hasn’t really gotten a hold in the Interracial/Multicultural romance niche. Stories about billionaires still rule in our little corner of romance, but I’m going to keep chipping away at that as much as I can. Otherwise, it’s going to get stale, and we can’t have that! Interracial/Multicultural romance is my jam and I love that superstar writers like Dez Burke, Theodora Taylor, Kenya Wright, and Violette Dubrinsky are trying to take the niche in new directions and to new heights. 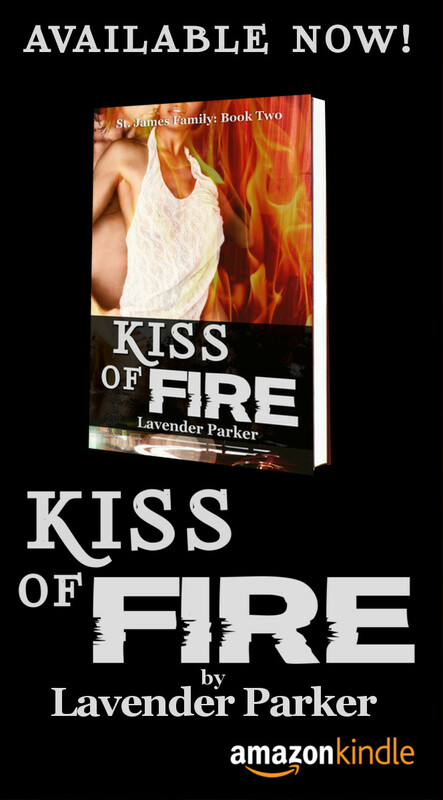 Kiss of Fire Release Date! Kiss of Fire is so close to being done I can taste it… I’m so excited to get it out to readers! The release date is MARCH 20th. Mark those calendars! Or better yet, like me on Facebook, follow me on Twitter, or keep coming back here to lavenderparker.com for all the latest news!